Urbanization ultimately presented New York and Brooklyn with an equine crisis of mind-numbing proportions. By the late 1880s, horses plying the roads were producing an estimated four million pounds of manure a day, plus 40,000 gallons of urine. Eric Morris, writing in ACCESS magazine, charts the fascinating rise and demise of the urban horse. In 1898, delegates from across the globe gathered in New York City for the world’s ﬁrst international urban planning conference. One topic dominated the discussion. It was not housing, land use, economic development, or infrastructure. The delegates were driven to desperation by horse manure. The horse was no newcomer on the urban scene. But by the late 1800s, the problem of horse pollution had reached unprecedented heights. The growth in the horse population was outstripping even the rapid rise in the number of human city dwellers. American cities were drowning in horse manure as well as other unpleasant byproducts of the era’s predominant mode of transportation: urine, ﬂies, congestion, carcasses, and trafﬁc accidents. Widespread cruelty to horses was a form of environmental degradation as well. The situation seemed dire. In 1894, the Times of London estimated that by 1950 every street in the city would be buried nine feet deep in horse manure. One New York prognosticator of the 1890s concluded that by 1930 the horse droppings would rise to Manhattan’s third-storey windows. A public health and sanitation crisis of almost unimaginable dimensions loomed. And no possible solution could be devised. After all, the horse had been the dominant mode of transportation for thousands of years. Horses were absolutely essential for the functioning of the 19th century city — for personal transportation, freight haulage, and even mechanical power. Without horses, cities would quite literally starve. All efforts to mitigate the problem were proving woefully inadequate. Stumped by the crisis, the urban planning conference declared its work fruitless and broke up in three days instead of the scheduled ten. The horse pollution problem was not a new one. Julius Caesar banned horse-drawn carts from ancient Rome between dawn and dusk in an effort to curb gridlock, noise, accidents, and other unpleasant byproducts of the urban equine. But conditions in the 19th century pushed the problem to new heights. First, America’s urban population swelled by 30 million souls between 1800 and 1900. These new citizens needed to be fed, clothed, and sheltered using materials delivered by horse. Second, despite the fact that cities were expanding outward, the tidal wave of new residents sent density levels soaring; New York’s rose from 39,183 per square mile in 1800 to 90,366 per square mile in 1900. Greater human crowding meant greater horse crowding as well, and problems that might have been tolerable in a sparsely populated rural region became unbearable in a densely packed urban one. Not only was the absolute number of people rising; per capita reliance on the horse was rising as well. Living standards were skyrocketing — from 1800 to 1900, US per capita gross domestic product rose from $US1148 to $US4676 (in 2000 dollar-terms). This meant greater trade, and virtually all goods were, at some point in their journey, transported by horse. In ten major US cities, the number of teamsters rose 328 percent between 1870 and 1900, while the population as a whole rose only 105 percent. At ﬁrst glance, it might seem as if the railroad would have offered relief from the horse pollution problem. But in fact it exacerbated it. Railroads were as much a complement for horses as a substitute for them. Nearly every item shipped by rail needed to be collected and distributed by horses at both ends of the journey. So as rail shipments boomed, so did shipments by horse. Ironically, railroads tended to own the largest ﬂeets of horses in 19th-century cities. This situation was made even worse by the introduction of the horse into an area from which it had been conspicuously absent: personal intra-urban transportation. Prior to the 19th century, cities were traversed almost exclusively on foot. Mounted riders in US cities were uncommon, and due to their expense, slow speeds, and jarring rides, private carriages were rare; in 1761, only 18 families in the colony of Pennsylvania (population 250,000) owned one. The hackney cab, ancestor of the modern taxi, was priced far beyond the means of the ordinary citizen. This changed with the introduction of the omnibus in the 1820s. Essentially large stagecoaches traveling ﬁxed routes, these vehicles were reasonably priced enough to cater to a much larger swathe of the urban population. By 1853 New York omnibuses carried 120,000 passengers per day. Needless to say, this required a tremendous number of horses, given that a typical omnibus line used 11 horses per vehicle per day. And the need for horses was to spiral even further when omnibuses were placed on tracks, increasing their speeds by 50 percent and doubling the load a horse could pull. Fares dropped again, and passengers clamored for the new service. By 1890 New Yorkers took 297 horsecar rides per capita per year. The consequences of the horse population boom were sobering. While the horse may be a charming and even romantic animal, when packed into already teeming and unsanitary cities its environmental byproducts created an intolerable situation. Horses need to eat. According to one estimate, each urban horse probably consumed on the order of 1.4 tons of oats and 2.4 tons of hay per year. One contemporary British farmer calculated that each horse consumed the product of ﬁve acres of land, a footprint which could have produced enough to feed six to eight people. Probably 15 million acres were needed to feed the urban horse population at its zenith, an area about the size of West Virginia. Directly or indirectly, feeding the horse meant placing new land under cultivation, clearing it of its natural animal life and vegetation, and sometimes diverting water to irrigate it, with considerable negative effects on the natural ecosystem. And what goes in must come out. Experts of the day estimated that each horse produced between 15 and 30 pounds of manure per day. For New York and Brooklyn, which had a combined horse population of between 150,000 and 175,000 in 1880 (long before the horse population reached its peak), this meant that between three and four million pounds of manure was deposited on city streets and in city stables every day. Each horse also produced about a quart of urine daily, which added up to around 40,000 gallons per day for New York and Brooklyn. The aesthetics of the situation require little editorial comment. Horse droppings were not only unsightly but their stench was omnipresent in the 19th-century city. Urban streets were mineﬁelds that needed to be navigated with the greatest care. “Crossing sweepers” stood on street corners; for a fee they would clear a path through the mire for pedestrians. Wet weather turned the streets into swamps and rivers of muck, but dry weather brought little improvement; the manure turned to dust, which was then whipped up by the wind, choking pedestrians and coating buildings. Municipal street-cleaning services across the country were woefully inadequate. Moreover, thanks to the skyrocketing horse population, even when it had been removed from the streets the manure piled up faster than it could be disposed of. Manure makes ﬁne fertilizer, and an active manure trade existed in the 19th-century city. However, as the century wore on the surge in the number of horses caused the bottom to fall out of this market; while early in the century farmers were happy to pay good money for the manure, by the end of the 1800s stable owners had to pay to have it carted off. As a result of this glut (which became particularly severe in summer months when farmers were unable to leave their crops to collect the dung), vacant lots in cities across America became piled high with manure; in New York these sometimes rose to 40 and even 60 feet. Needless to say, these were not particularly beloved by the inhabitants of the 19th-century city. The problem extended far beyond aesthetics. Though horse manure harbors tetanus spores, in and of itself it is not a major health risk. But a byproduct of it is. Horse manure is the favored breeding ground for the house ﬂy, and clouds of ﬂies hatched in it (one estimate is that three billion ﬂies hatched in horse manure per day in US cities in the year 1900). Flies are, of course, unsightly and annoying pests, and they are also potent disease vectors. Flies pick up bacteria and other pathogens on their feet, hairy appendages, and proboscides, then transmit them as they ﬂy between ﬁlth and humans and their food. They also deposit germs through their feces and vomit. Flies transmit dozens of diseases, and studies have found that 19th century outbreaks of deadly infectious maladies like typhoid and infant diarrheal diseases can be traced to spikes in the ﬂy population. Horses killed in other, more direct ways as well. As difﬁcult as it may be to believe given their low speeds, horse-drawn vehicles were far deadlier than their modern counterparts. In New York in 1900, 200 persons were killed by horses and horse-drawn vehicles. This contrasts with 344 auto-related fatalities in New York in 2003; given the modern city’s greater population, this means the fatality rate per capita in the horse era was roughly 75 percent higher than today. Data from Chicago show that in 1916 there were 16.9 horse-related fatalities for each 10,000 horse-drawn vehicles; this is nearly seven times the city’s fatality rate per auto in 1997. Horses often fell, on average once every hundred miles of travel. The reason is that horse-drawn vehicles have an engine with a mind of its own. The skittishness of horses added a dangerous level of unpredictability to 19th-century transportation. This was particularly true in a bustling urban environment, full of surprises that could shock and spook the animals. Horses often stampeded, but a more common danger came from horses kicking, biting, or trampling bystanders. Children were particularly at risk. In addition, the vehicles themselves (especially the omnibus) presented safety hazards. They were difﬁcult to brake, and the need to minimize friction meant that they required large wheels. These made for top-heavy, ungainly carriages prone to capsizing, a problem exacerbated by winding street layouts. Moreover, drivers had a reputation for recklessness. Other byproducts of the urban horse were less deadly but unwelcome nevertheless. The clatter of horseshoes and wagon wheels on cobblestone pavement jangled 19th-century nerves. Many have blamed the noise created by iron horseshoes on hard pavement for the nervous disorders which seemed to plague cities far more than rural areas. Congestion was another problem. Trafﬁc counts indicate that trafﬁc across the nation more than doubled between 1885 and 1905. Not only was the number of vehicles rising rapidly, but the nature of the vehicles themselves caused tremendous problems. A horse and wagon occupied more street space than a modern truck. Obviously, horsedrawn vehicles traveled at very slow speeds, and horses, especially those pulling heavy loads or hitched in teams, started forward very slowly, a great difﬁculty in stop-and-go conditions. Streets of the era were not adequate to handle the trafﬁc, and hills caused problems. In addition, horses often fell, on average once every hundred miles of travel. When this took place, the horse (weighing on average 1300 pounds) would have to be helped to its feet, which was no mean feat. If injured badly, a fallen horse would be shot on the spot or simply abandoned to die, creating an obstruction that clogged streets and brought trafﬁc to a halt. 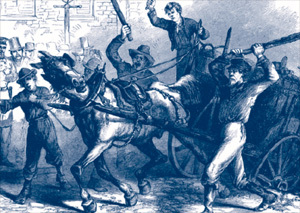 Dead horses were extremely unwieldy, and although special horse removal vehicles were employed, the technology of the era could not easily move such a burden. As a result, street cleaners often waited for the corpses to putrefy so they could more easily be sawed into pieces and carted off. Thus the corpses rotted in the streets, sometimes for days, with less than appealing consequences for trafﬁc circulation, aesthetics, and public health. Falls were not the only reason horses expired in the streets. One might think it would be in the interest of horse owners to keep their animals in good condition; a horse was a fairly large capital investment. But unfortunately, economics caused owners to reach quite the opposite conclusion. Due to the costs of feeding the animals and stabling them on expensive urban land, it made ﬁnancial sense to rapidly work a small number of horses to death rather than care for a larger group and work them more humanely. Horses were rapidly driven to death; the average streetcar horse had a life expectancy of barely two years. As a result, horses were rapidly driven to death; the average streetcar horse had a life expectancy of barely two years. In 1880, New York carted away nearly 15,000 dead equines from its streets, a rate of 41 per day. In addition to frequent whippings and beatings from drivers, urban horses faced another peril: the condition of the street surfaces. Paved streets were far more slippery than the dirt roads they replaced. They were especially slick when wet or frozen. Horses, shod in iron shoes providing poor traction, frequently lost their step and tumbled, often to their deaths. All of these problems — the ﬁlth, ﬂies, disease, and cruelty — came to a head in the 19th-century stable. Stables were generally dark and lacked ventilation; some were rarely cleaned and reeked of excrement. Due to the expense of urban land, horses were crowded into them. This was not just uncomfortable; it was deadly as well, as it left horses open to the ravages of infectious disease. The Great Epizootic Epidemic of 1872 killed about ﬁve per cent of the urban horses in the Northeast and debilitated many others. Transportation halted, food prices soared, goods piled up at the docks. Fire ravaged downtown Boston because there were not enough healthy horses to pull the ﬁre trucks. Society eventually took action against the problem on numerous fronts. Henry Bergh founded the ASPCA in 1866 primarily to improve the lot of the urban horse. In the 1890s, Colonel George E. Waring Jr professionalized New York’s street sweeping service with tremendous effect; his reforms were widely copied across the country. At the same time the electric streetcar usurped the horse’s role as the primary mode for intra-urban personal transportation. At the turn of the 20th century, William Phelps Eno invented the rules of the road to reduce the number of accidents caused by horse-drawn vehicles; he is credited with devising the stop sign, the stop light, the yield sign, the crosswalk, the pedestrian island, the one-way street, the trafﬁc circle, and the taxi stand. In addition, he codiﬁed driving on the right side of the road. But it would take one more innovation to end the problem once and for all. In the 1890s, improvements in the internal combustion engine, legal and political developments which severely restricted the power of cities to regulate the types of trafﬁc on their streets (won by bicycle advocates), the aforementioned invention of trafﬁc rules, and smooth new asphalt street surfaces paved the way for the private automobile. Enticed by high speeds, point-to-point travel and the ﬂexibility to roam across the urban landscape, the public adopted the new innovation in droves. Contemporary observers calculated that cars were cheaper to own and operate than horse-drawn vehicles, both for the individual and for society. In 1900, 4192 cars were sold in the US; by 1912 that number had risen to 356,000. In 1912, trafﬁc counts in New York showed more cars than horses for the ﬁrst time. The equine was not replaced all at once, but function by function. Freight haulage was the last bastion of horse-drawn transportation; the motorized truck ﬁnally supplanted the horse cart in the 1920s. As difﬁcult as it may be to believe for the modern observer, at the time the private automobile was widely hailed as an environmental savior. In the span of two decades, technology eradicated a major urban planning nightmare that had strained governments to breaking point, vexed the media, tormented the citizenry, and brought society to the brink of despair. Yet, given the environmental problems that the automobile has brought, it is worth asking: was this a Faustian bargain? In all probability the answer is no. Perhaps in total the negative externalities produced by the automobile are greater than the damage caused by the urban horse, but this is because the numbers of vehicles and the amount of travel have skyrocketed. Per vehicle and per mile, it seems highly likely that the environmental problems caused by the horse were far greater than those of the modern car. Horses even contribute to global warming: manure releases methane, a greenhouse gas eight times more potent that carbon dioxide. The environmental triumph of the private automobile sheds interesting light on modern problems of transportation and the environment. Today, many observers believe that only a drastic reduction of travel and/or a switch to slower and more inconvenient modes can mitigate transportation’s negative externalities. But neither draconian regulations nor disincentives for travel were necessary to ﬁx the horse pollution problem. Human ingenuity and technology (enabled by government, which provided infrastructure and regulations) did the job — and at the same time they brought a tremendous concurrent increase in mobility. Of course, the technological solution brought externalities of its own, and our solutions for those externalities will undoubtedly introduce a fresh set of unexpected problems. But with determination and inventiveness, perhaps one day the environmental consequences of the private car will be as dim a memory as the horse pollution crisis of the 19th century. • Eric Morris undertook his doctoral studies into transportation at the University of California, Los Angeles. auto drivers carry liability insurance, but do you have any info re how horse accidents/injuries were dealt with?